Rotoform 4G FD is an efficient, steel belt-based granulator used for the pastillation of a wide range of food products including chocolate, emulsifiers and fats. Molten chocolate is fed into the Rotoform unit, and deposited onto a continuously running stainless steel cooling belt in the form of drops. The belt runs at a speed synchronized to that of the depositor, ensuring that the hemispherical drops are of a consistent size and shape. The heat of the chocolate melt is transferred to cooling air blown onto the product and also to the belt itself. The excellent thermal conductivity of the belt delivers fast, controlled solidification and the chocolate pastilles are discharged cleanly at the end of the system. 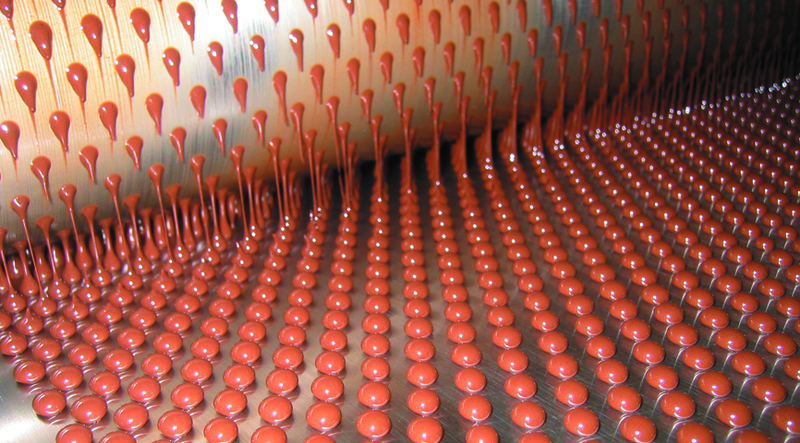 Our Rotoform 4G FD granulation system is specifically designed for the pastillation of a wide range of food products and ideally suited for the pastillation of chocolate. Offering all the benfits of the basic Rotoform granulation system – reliability, product quality and easy of operation – Rotoform FD granulator has been developed to maintain the highest standards of hygiene. IPCO steel belts are used for processing chocolate and other confectionery products, with applications ranging from simple conveying to continuous processes such as cooling/solidification, conditioning, drop-forming, casting, freezing, baking and finishing.The key benefits of a stainless steel conveyor belt are outstanding thermal properties, excellent return on investment and unparalleled cleanability for maximum hygiene. Cooling is a major application, and one in which we can provide end-to-end process expertise, supplying not only the steel belts but also feeding, cooling and associated control equipment. These systems are widely used for cooling and solidifying, with applications including chocolate and sugar mass, as well as caramel, gelatine, hard melt candy, nougat, nut brittle and more. For many customers, their main requirement is straightforward conveying of products like sugar and cocoa mass, and we can supply replacement conveyors for existing systems, steel belts for OEMs, or complete installations including drums, supports, tracking controls and cleaners/scrapers.